We’d love your help. Let us know what’s wrong with this preview of Golden by Cameron Dokey. After sixteen years of rais Before Rapunzel's birth, her mother made a dangerous deal with the sorceress Melisande: If she could not love newborn Rapunzel just as she appeared, she would surrender the child to Melisande. When Rapunzel was born completely bald and without hope of ever growing hair, her horrified mother sent her away with the sorceress to an uncertain future. Golden: A Retelling of "Rapunzel"
To ask other readers questions about Golden, please sign up. Is there a chance to translate this book into Spanish, so in Argentina we can read it too? Recommends it for: Fairy tale suckers I mean... lovers of course! I wanted to hug this book literally when I was done. Perfect . Exactly what a true fairy tale should be. I'm seriously thinking about reading ALL Rapunzel retellings to see if there is one out there that can do it better than Dokey. Rapunzel is bald. What? Yeah I didn't think I could get on board with this but it worked. The sorceress isn't evil and Rapunzel doesn't end up with a prince per say. So some major changes. Unlike last time (with Sunlight and Shadow)the length didn't hurt the book. R I wanted to hug this book literally when I was done. Perfect . Exactly what a true fairy tale should be. I'm seriously thinking about reading ALL Rapunzel retellings to see if there is one out there that can do it better than Dokey. Rapunzel is spunky and her relationship with Harry is what really shines in this story. There is of course the sappy message, but you know it made sense in a real life level. The author supplied the best "love at first sight" explanation I've encountered in a book. I won't attempt to explain, it's done better in the book. I have no real complaints about this book. It is the most satisfying book I've read of the series so far (I've read 3 of them just so you know). Rapunzel starts off by telling us that the tale we have grown up with about her is inaccurate and she precedes to tell us the real story. The story sure has its differences: Rapunzel is bald, the sorceress is good, a prince is involved but isn't the only one to take credit in saving Rapuzel, and Rapunzel doesn't get stuck in a tower until near the last q I have no real complaints about this book. It is the most satisfying book I've read of the series so far (I've read 3 of them just so you know). Rapunzel starts off by telling us that the tale we have grown up with about her is inaccurate and she precedes to tell us the real story. The story sure has its differences: Rapunzel is bald, the sorceress is good, a prince is involved but isn't the only one to take credit in saving Rapuzel, and Rapunzel doesn't get stuck in a tower until near the last quarter of the book. Like the other Dokey books you hear a lot about the "heart" but it didn't bother me like it did in the other one. Plus the whole love-at first-sight thing was sort of clarified. I'd never been a none believer of love-at-first-sight but I never really thought about it in deapth till now. Dokey described it in a way that made sense to me. I enjoyed Rapunzel's character. For being so distant from people, she wasn't strange(if you don't count that she's bald)and she had a backbone. I liked that she didn't think of herself as ugly just because she was bald (although she did want hair). This book gives me lots of hope for the others in the series. Its a great fast, light-hearted read. I would really give this 2 1/2 stars if I could. I was really enjoying the first half. I liked the depth that the Rapunzel story had been given and loved the character of Rapunzel. However, once it got the second half with the enchanted tower and the witch's daughter, Rue, it started to fall apart for me. Rue was supposedly locked in the tower until someone, besides her mother, came along that truly loved her. The witch has always thought Rapunzel would be the one to break I would really give this 2 1/2 stars if I could. I was really enjoying the first half. I liked the depth that the Rapunzel story had been given and loved the character of Rapunzel. However, once it got the second half with the enchanted tower and the witch's daughter, Rue, it started to fall apart for me. Rapunzel is, well, perhaps not what you’d expect. As bald as an egg, raised by a sorceress, and actually not the most polite young lady ever to pull all the carrots out of a garden. But she does have the ability to see the truth. And into the hearts of almost everyone. And maybe that of the tinker’s boy who insists upon calling her Parsley. Quite a bit of fun and a surprisingly radical tale for one so often stuck up in a tower. Rapunzel is my favorite fairy-tale, so you can imagine my skepticism learning the Rapunzel in this version has no hair. Absolutely none at all. But I was charmed by the author’s way with words, and by the end, she had me with her version of this story (even if I loved it for very different reasons than I love the original tale). I read the whole thing in about an hour and a half. It’s not very long, but it packs a nice little punch. Well worth the effort. There are other changes to the tale, both Rapunzel is my favorite fairy-tale, so you can imagine my skepticism learning the Rapunzel in this version has no hair. Absolutely none at all. But I was charmed by the author’s way with words, and by the end, she had me with her version of this story (even if I loved it for very different reasons than I love the original tale). I read the whole thing in about an hour and a half. It’s not very long, but it packs a nice little punch. Well worth the effort. There are other changes to the tale, both of the superficial nature and a bit more significant. Rapunzel’s mother does crave an herb from a witch’s garden, and her father does steal that herb for her, but in this version the witch is not evil, although she does take Rapunzel from her parents. In this case, it’s because she believes the vain mother (who herself possesses vast quantities of beautiful golden hair) will not be capable of loving her daughter, who has aforementioned zero hair. The witch takes Rapunzel and raises her as her own child. When Rapunzel has grown up, however, the story takes a left turn, involving a tinker, witch-hunting, and a spell placed on the witch’s daughter. A perfect retelling of a story. I loved the alternate twist and the reason for it. Everyone knows the girl in the tower with the long, long golden hair, but no one knows the Rapunzel of this story. Why? Because there is another girl. 3.5 stars. I'm giving this an extra 0.5 star on Goodreads, however, because this novel is quite dear to me. I don't know how many times I've read this ever since I got hold of it way back in 2010 (the purchase of it was utterly random, though; who would have thought that I would love it this much?). Have you ever read a book wherein, once you dissect its elements, you realize how, to say the least, awful it is on many levels? How it sometimes doesn't seem to make the slightest sense, how the plo 3.5 stars. I'm giving this an extra 0.5 star on Goodreads, however, because this novel is quite dear to me. I don't know how many times I've read this ever since I got hold of it way back in 2010 (the purchase of it was utterly random, though; who would have thought that I would love it this much?). Have you ever read a book wherein, once you dissect its elements, you realize how, to say the least, awful it is on many levels? How it sometimes doesn't seem to make the slightest sense, how the plot sometimes seems . . . off and even ludicrous? And yet, despite all these, you find yourself unable to hate this accursed novel completely, even going so far as to proclaim that you like it? Well, dear reader, that is precisely how I feel about this one. When I was younger, what really appealed to me was the tone of the story, and the very spunky character of Rapunzel. I even aspired to be like her, then. Her bravery was really admirable. Maybe that's the reason why I still love this--my perception of it is already colored by the intensity of my feelings then. Or perhaps I found a thread of connection between Rapunzel and me. I would never know. Golden is a retelling of Rapunzel, but, as with every retelling, there's a twist. Scratch the image of the Rapunzel you know--the one with the lustrous golden mane, flowing down the length of the rustic tower she's entrapped in. This Rapunzel is bald as an egg, and she's not your typical damsel in distress either. In fact, she's the one who does the saving in the story. She is, in the truest sense of the word, the heroine of this tale. 1) For some reason, Melisande knew that the couple's baby would be a girl. In fact, judging from how she made the woman promise, it seemed like she was aware of what Rapunzel would turn out to be--that is, bald. And yet, later on, she said that she could not really see the future. How does this explain her very prophetic behavior earlier, then? 3) The wizard thing. It just seems so childish to me--come on, you're going to put such a massive curse on someone just because of that? 5) When Rapunzel was so hurt because Harry misunderstood him. Oh, for crying out loud! Give the guy a break! How on earth was he supposed to interpret you just did, after having witnessed everything himself? If Rapunzel just paused for a while and kept her emotions at bay, she might have realized that Harry's actions only meant that he really did love her. 6) The entire prince business. It just doesn't seem believable. And the readers can see how Rapunzel placed prime importance on Rue's looks, as if that solved everything, as if physical appearance was the most important thing in the world. 7) The prince is just such a shallow character. Too 2-dimensional for my taste. And a bit of an idiot. Come on, you're talking about marriage--you're talking about entrusting your kingdom to another person, which, in this case, turns out to be a complete stranger. But never mind, she's pretty anyway. Never mind, too, that you've only spoken for minutes prior to the marriage proposal. 8) What happened to Rapunzel's mother, by the way? Was it ever mentioned? 9) Oh, and before I forget it. The sorcerer business. It just isn't as clear as I hoped it would be. The people's sentiments towards a sorceress is just a bit too conflicting and confusing for my liking. I will never know if it's fear or something else. This was my first try at reading a book based on an old fairy tail, in this case, Rapunzel. I am most definitely hooked, and it won't be my last. I would have read this book in one sitting had life not gotten in the way (don't you hate when that happens!). Melisande is a very powerful sorceress deep in the forest. Before Rapunzel was born, her mother made a pact with Melisande that if she had a baby she just couldn't love, Melisande would raise her. When Rapunzel was born, her mother looked down This was my first try at reading a book based on an old fairy tail, in this case, Rapunzel. I am most definitely hooked, and it won't be my last. I would have read this book in one sitting had life not gotten in the way (don't you hate when that happens!). Melisande is a very powerful sorceress deep in the forest. Before Rapunzel was born, her mother made a pact with Melisande that if she had a baby she just couldn't love, Melisande would raise her. When Rapunzel was born, her mother looked down at her bald child, and realized there was no way she could ever love her, and so the infant Rapunzel was taken to Melisande. Rapunzel absolutely adores Melisande, the only mother she has ever know. However, things begin to change when Rapunzel reaches the age of 16. Melisande has some very big secrets, ones that change Rapunzel's life forever - more than just the fact that she is not the biological child of her mother. I liked where the author went with the original story and how it ended. SUMMARY: Before Rapunzel's birth, her mother made a dangerous deal with the sorceress Melisande: If she could not love newborn Rapunzel just as she appeared, she would surrender the child to Melisande. When Rapunzel was born completely bald and without hope of ever growing hair, her horrified mother sent her away with the sorceress to an uncertain future. After sixteen years of raising Rapunzel as her own child, Melisande reveals that she has another daughter, Rue, who was cursed by a wizard yea SUMMARY: Before Rapunzel's birth, her mother made a dangerous deal with the sorceress Melisande: If she could not love newborn Rapunzel just as she appeared, she would surrender the child to Melisande. When Rapunzel was born completely bald and without hope of ever growing hair, her horrified mother sent her away with the sorceress to an uncertain future. After sixteen years of raising Rapunzel as her own child, Melisande reveals that she has another daughter, Rue, who was cursed by a wizard years ago and needs Rapunzel's help. Rue and Rapunzel have precisely "two nights and the day that falls between" to break the enchantment. But bitterness and envy come between the girls, and if they fail to work together, Rue will remain cursed... forever. REVIEW: When I first started this story and learned that Rapunzel was bald, I wasn't sure how it was going to work; but Dokey put an interesting twist on the Rapunzel tale that made it quite interesting. The ending was delightful and definitely a different variation. Once again Dokey has used interesting and inventive twists to make this into an enjoyable young adult/adult story. This book is mesmerizing and Rapunzel is a strong heroine who during her journey learns to value herself just as she is. Harry is a great bumbling "tinker's boy" and Jake is the "true prince" looking for real love. With a twist to the ending, this is another very good Once Upon a Fair Tale series read. FAVORITE QUOTES: "There's a reason you're to supposed to say the very first thing that comes into your head. If you don't take the time to think through your words, you end up being rude just as often as not." "A good act that is compelled is not goodness at all, but merely force." "What is in the heart cannot be forced.....If the heart bends, it must be of its own free will or not at all." "Maybe all young men who love us become knights in shining armor when we love them back." I can point out a lot of good things about this book. For one, it definitely took after the original tale of Rapunzel but giving it a rather surprising twist. When we hear “Rapunzel” we immediately think EXTREMELY LONG BLONDE HAIR. But with Dokey’s Golden, we find our heroine BALD. Yup, you read it right; Rapunzel is B-A-L-D. I absolutely loved the idea. It was so fresh and the story of how she ended up with the sorceress was cunning. Another thing I was fond of was Rapunzel herself. She’s spunky I can point out a lot of good things about this book. For one, it definitely took after the original tale of Rapunzel but giving it a rather surprising twist. When we hear “Rapunzel” we immediately think EXTREMELY LONG BLONDE HAIR. But with Dokey’s Golden, we find our heroine BALD. Yup, you read it right; Rapunzel is B-A-L-D. I absolutely loved the idea. It was so fresh and the story of how she ended up with the sorceress was cunning. Another thing I was fond of was Rapunzel herself. She’s spunky and charming. Usually, when I read about princesses or damsels in fairy tales they seem to always be mistreated and distressed. Here I find a girl who, despite having known how her past was, is a lively and strong-willed character who doesn’t have to be all nice and sweet. I also like the idea that the person who took Rapunzel from her parents was not the villain in the story. Henry and Mr. Jones were also characters that I adored. I love Henry and Rapunzel’s bickering, I find them so entertaining. I was really into my reading up until I reached the part where Rapunzel had to stay in the tower. It got a little TOO twisted at this part and I was just not getting what Rapunzel’s plan was on how to get out of that tower. Another let down was the fact that when we finally reached the climax of the story, it was over by a blink of an eye. That fast? I didn’t even get how the story got there. And then they lived happily ever after… that was it. Just when I thought this was going to be one of those books in the Once Upon A Time series that I’d come to love. *Sigh* So sad. But I did appreciate how wise Dokey was to still incorporate how the tale we know of Rapunzel now with what she has recreated. That part of the ending was something that made me smile in spite of my displeasure. I found this story to be engaging even though it would not be the type of story i would pick up on my own. I liked that Dokey gave a twist to the "classic" tale of Repunzel. I liked the character of the original Repunzel, she was a spunky girl. Her relationship with Harry reminds me of my relationship with my husband because we are both very sarcastic and very proud people. I liked the interactions between Rue and Repunzel, they bickered as if they were truly sisters. However, I did not like the I found this story to be engaging even though it would not be the type of story i would pick up on my own. I liked that Dokey gave a twist to the "classic" tale of Repunzel. I liked the character of the original Repunzel, she was a spunky girl. Her relationship with Harry reminds me of my relationship with my husband because we are both very sarcastic and very proud people. I liked the interactions between Rue and Repunzel, they bickered as if they were truly sisters. However, I did not like the character of Alex at all. I found him to be a very weak character, but I guess if Dokey was changing aspects of the "classic" tale then she had to do something with the prince. The prince is usually strong and not clumsy, but Alex was gulliable, clumsy, and overall a weak character. I can see teenagers liking this novel because many of the characters are a bit snarky. Teenagers are attacked to sarcasm. I also think teenagers are attacked to retellings of stories. This story almost reminded me of the play Wicked where the story we knew was not necessarily the story that actually played out. I can see girls being more attacted to this novel than boys because the girls characters are the protagonists and it is a overall a romance story. This is a very original take on the classic fairy-tale of Rapunzel. Instead of the sorceress being an evil old women who locks Rapunzel up in a tower until she's saved by the prince, it's COMPLETELY different. Quick Overview: Rapunzel is born completely bald, the one stuck in a tower is the sorceress's daughter Rue, who is not put there by the sorceress, and the prince doesn't technically save anyone from a tower. The sorceress finds Rapunzal's father stealing rapunzel(of course) from her garde This is a very original take on the classic fairy-tale of Rapunzel. Instead of the sorceress being an evil old women who locks Rapunzel up in a tower until she's saved by the prince, it's COMPLETELY different. Quick Overview: Rapunzel is born completely bald, the one stuck in a tower is the sorceress's daughter Rue, who is not put there by the sorceress, and the prince doesn't technically save anyone from a tower. The sorceress finds Rapunzal's father stealing rapunzel(of course) from her garden. She makes a bargain with him and his wife. If they cannot love the child as she is born than the sorceress will keep her. Rapunzel's mother is a beautiful but shallow woman, and when she sees that the child is completely bald she simply can't love her. The father, though heart broken must keep his word. The sorceress raises Rapunzel as her own daughter and she grows up to be a smart and confident girl. But things are soon going to change for her. 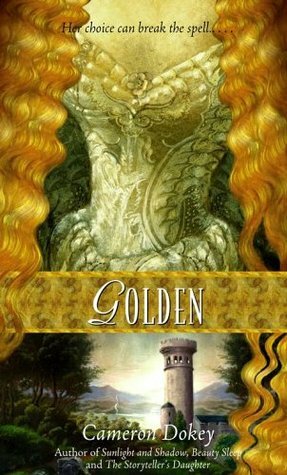 Golden is a retelling of the story of Rapunzel but with a few twists and turns along the way. For one thing, Rapunzel is born bald and she is not trapped in a tower but someone else is. Rue, the sorceress' daughter, is trapped in a tower and she is the owner of long roped locks of golden hair. Rue does need Rapunzel's help however to be freed from the tower that imprisons her. I feel that this story was well told and is an interesting interpretation. Young adult readers will like it because it i Golden is a retelling of the story of Rapunzel but with a few twists and turns along the way. For one thing, Rapunzel is born bald and she is not trapped in a tower but someone else is. Rue, the sorceress' daughter, is trapped in a tower and she is the owner of long roped locks of golden hair. Rue does need Rapunzel's help however to be freed from the tower that imprisons her. Have I ever mentioned how much I love fairy tales? Golden is a beautifully done retelling of Rapunzel. Melisande the sorceress catches a man stealing an herb, rapunzel (parsely), from her garden because his pregnant wife has a craving. The mother, although beautiful, is selfish and is unable to love her newborn daughter because the girl was born completely bald. Melisande adopts the girl, who remains bald. When Rapunzel is 16, she learns that Melisande has a daughter who is trapped in a tower as Have I ever mentioned how much I love fairy tales? Golden is a beautifully done retelling of Rapunzel. Melisande the sorceress catches a man stealing an herb, rapunzel (parsely), from her garden because his pregnant wife has a craving. The mother, although beautiful, is selfish and is unable to love her newborn daughter because the girl was born completely bald. Melisande adopts the girl, who remains bald. When Rapunzel is 16, she learns that Melisande has a daughter who is trapped in a tower as a result of a wizard's enchantment. It is up to Rapunzel to figure out how to find true love and rescue Melisande's daughter, Rue from her tower. "That is what love is, I thought. A possibility that becomes a choice. A choice you keep making, over and over. Day after day. Year after year. Time after time." The heroines are strong and they are rescued as a result of their brave and true hearts, rather than because the big, strong men save them. Hooray for girl power! I picked this up as a quick read at the library thinking that it'd be one of those books you read and toss and ended up actually REALLY liking it! The plot line moves along at a great steady pace. The characters are refreshingly original and I love the twist on the story! I almost wish there was a sequel to it so we could see what happens to everyone after the end of the story! Unfortunately my library doesn't have any other books by this author or I'd have picked up another! THIS IS A SPINOFF, not a retelling. Rapunzel isn't the maiden in the tower, but a miserably cursed girl destined to be bald for life. Why? Oh, some wizard had a temper tantrum with the sorceress--who is NOT the villain here, but Rapunzel's mother figure. The book is boring, bland and long-winded with doggone stupid insta-love that makes Disney romances look like stalled engagements. After I complete Once, I'm done with Dokey. She does retellings horribly. A true retelling maintains the CORE story THIS IS A SPINOFF, not a retelling. Rapunzel isn't the maiden in the tower, but a miserably cursed girl destined to be bald for life. Why? Oh, some wizard had a temper tantrum with the sorceress--who is NOT the villain here, but Rapunzel's mother figure. The book is boring, bland and long-winded with doggone stupid insta-love that makes Disney romances look like stalled engagements. I fell in love with the story of Rapunzel from my very first encounter with the story when I saw Barbie as Rapunzel to Disney's Tangled. I was excited to read Golden for the specific reason that it was a Rapunzel retelling. I fell in love with Cameron's Dokey's changes to the story. As it turns out Rapunzel's mother has a heart made of stone and can make no room in her heart for Rapunzel. Her mother has hair that is long and beautiful, but Rapunzel is born completely bald. Melisande, a sorceress, takes Rapunzel under her care and raises Rapunzel as her own. The part I really liked about Golden is how much development was put into Rapunzel's childhood. I found it odd that Rapunzel was so free and her mother was not evil, but later in the novel it is explained. People come to visit the sorceress and Rapunzel, but only one is welcome. That is the tinker and his son Harry. There was always some odd about the tinker. I couldn't put my finger on it until Rapunzel discovered it at the end. Harry, he is a typical boy, teasing and carefree. We see a friendship start to form with him and Rapunzel. One that grows with age and changes over time. I loved the parts with Harry and Rapunzel best. Everything about Rapunzel's life is happy and normal until she turns 16. Something in Rapunzel's life changes when she turns 16. That is when Rapunzel learns about Rue, the girl with long beautiful hair, who is trapped in a tower. She has two days to free Rue from the curse put upon her by a wizard. It isn't easy to build a relationship in two days time and Dokey shows that although only in little pieces. I do wish there was more development to this story in the end. I think the relationships could have been built and explained more instead of just happening. I know it is a fairy tale, but that doesn't mean happily ever after always has to happen quickly and without struggles and triumphant. I felt a bit cheated by the end of the novel because I think there was still more of a story to be told. I loved the ending Dokey gave to Golden. I just think there could have been more development into the lead up of the ending. The premise of the story is interesting. We have a bald Rapunzel being raised like a daughter to a sorceress. For a while there is nothing about hair or a tower or a prince. And it quickly convinced me that Rapunzel would never grow hair. So how is this a retelling of the famous story? I also found it very intriguing that the sorceress’s gift was to see into the hearts of others, and she could reflect that heart back to them. While at first this was only an interesting feature to the story, it plays a major roll later. The book started out interesting, but slow. Cameron Dokey takes a lot of time to build the world that Rapunzel lives in. And as I said before, it is not recognizable as a world past Rapunzels lived. It does work out in the end though. We get a tower, hair(not Rapunzel’s), and a prince, though none of them came about the way I thought they would. The only thing I did have figured out was Rapunzel was never to grow hair. I really liked the ending. The sorceress’ gift foreshadows and leads the whole story. It is all about what is seen in the heart. It is about true motives, loyalty, and learning to love. While the story line and premise was very interesting, I did have a few problems with the writing style. Cameron Dokey personified everything. And I mean everything! I don’t mind personification, but it was way over used. Another writing device that was over used was telling something in the beginning of the chapter, then taking the whole chapter to explain it. Such as, “It was the cat who decided things in the end.” Then taking the whole chapter to explain how the cat even fits in. And it did not actually ‘decide’ things; it just created a diversion and a bond between two characters. Again, I don’t mind authors that do this, but it was overused in this story. Overall, I liked the story, but the writing could have been better. I like that it was not the typical Rapunzel tale. Although it is not a fav, it is a good little book. [close:] In older versions of the classic tale Rapunzel, it always seemed improbable that a grown man could scale a tower using only his beloved's hair. Not so in Paul O. Zelinsky's Caldecott Medal-winning version of Rapunzel. Here, Rapunzel's reddish-blonde mane is thick with waves and braids, and cascades like a waterfall down the walls of her isolation tower. In Zelinsky's able hands it's easy to believe that a prince would harbor no hesitations about scrambling up our fair heroine's hair. Of [close:] In older versions of the classic tale Rapunzel, it always seemed improbable that a grown man could scale a tower using only his beloved's hair. Not so in Paul O. Zelinsky's Caldecott Medal-winning version of Rapunzel. Here, Rapunzel's reddish-blonde mane is thick with waves and braids, and cascades like a waterfall down the walls of her isolation tower. In Zelinsky's able hands it's easy to believe that a prince would harbor no hesitations about scrambling up our fair heroine's hair. I really enjoyed this retelling of Rapunzel. Last semester I took the course the Art of the Children's Book and wrote a paper comparing three different versions of the classic tale of Rapunzel, therefore, I was very interested in reading this. While the three versions stories and illustrations all varied slightly, overall, they were very similar. Golden, on the other hand, had a great twist. I loved the fact that in this rendering, Rapunzel is completely bald. Dokey takes away the most well know I really enjoyed this retelling of Rapunzel. Last semester I took the course the Art of the Children's Book and wrote a paper comparing three different versions of the classic tale of Rapunzel, therefore, I was very interested in reading this. While the three versions stories and illustrations all varied slightly, overall, they were very similar. Golden, on the other hand, had a great twist. I loved the fact that in this rendering, Rapunzel is completely bald. Dokey takes away the most well known feature of the classic character, and instead introduces new characters like Rue in order to create a unique translation. I appreciated the changes that were made, yet I was happy that it still ended with a happily-ever-after. In the end there are two happy couples and Rapunzel becomes Susan, spending the rest of her life with her love, Harry. This was beautiful, fun, and just about perfect in its genre. If you enjoy retellings of classic fairy tales (with the requisite unexpected twists--here Rapunzel is bald! ), this is as good as it gets. Dokey's story is rich in imagery and character, it is moral and right, and it is lovely in its relationships and development. Love this quote: p.91: "As long as a thing is unknown, it belongs to us in a way that well-known things do not. For we have the opportunity to fill the empty, unknown spaces This was beautiful, fun, and just about perfect in its genre. If you enjoy retellings of classic fairy tales (with the requisite unexpected twists--here Rapunzel is bald! ), this is as good as it gets. Dokey's story is rich in imagery and character, it is moral and right, and it is lovely in its relationships and development. Det känns som väldigt mycket som en saga. Det är kanske inte så vanligt att en saga är berättad ur första-person, men det var någonting med berättandet som kändes väldigt mycket som en saga. Mysig och jag trodde att den kanske skulle sluta i en annan riktning än den gjorde. Författaren avslutar med en litet meddelande om hur det kom sig att hon skrev en retelling av Rapunzel utan hår. Det var en fin anledning tyckte jag.